Vote for Us! 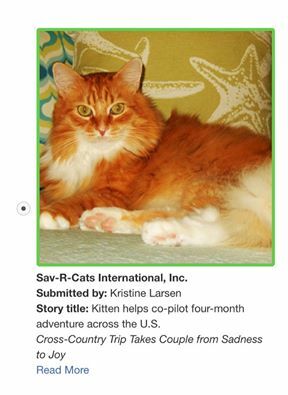 Petco Foundation Grant Finalist | Sav-R-Cats International, Inc. Please take a moment to vote for us (if you haven’t yet already) for a chance for us to win a grant from Petco Foundation. We are a Holiday Wishes finalist for 2016 and are now competing in the Holiday Wishes People’s Choice Bonus Round. You can help us win up to $25,000! You can vote 1 time and voting ends Saturday, December 31 at 11:59 PM CT. This entry was posted in News on December 9, 2016 by savrcats.